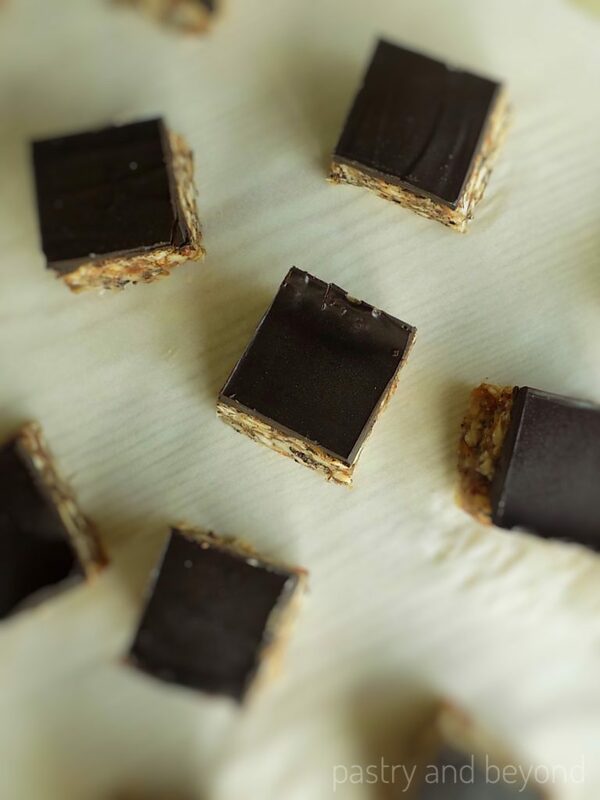 When you crave sweet, you can make these 3 ingredient healthy no bake date nut bars. Only one mini bar will be enough to stop your craving! 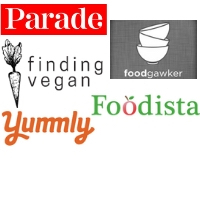 I’m planning to share more healthy, no added sugar recipes. Dates, figs, raisins, bananas, applesauce work very well as natural sweeteners. 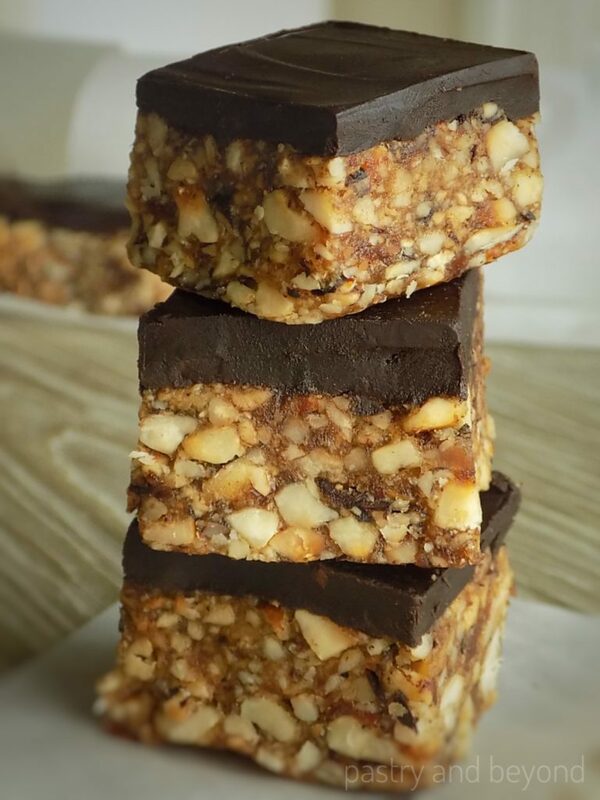 In this recipe, I sweeten these hazelnuts bars with dates. I use the same amount of dates and hazelnuts. I pour dark chocolate with 80% cocoa on top. These bars are slightly chewy. If you want, you can increase the number of dates to make them chewier. I use all the healthy ingredients. For example, dates have so many benefits; they are rich in iron, vitamins and minerals which help to lower blood pressure. You can read more about dates in Natural Society’s article. Although dates are very healthy, you shouldn’t eat too much as their sugar content is high. Hazelnuts have many benefits as well, they are full of vitamins and minerals. They are good for our hair, skin and nails. You should try to keep the skin of the hazelnuts as they are full of antioxidants. You can read more in Best Health and Live Strong‘s articles. And my third ingredient dark chocolate is also full of antioxidants. It is good for brain and heart. It is said that it protects us against the sun. You can read more in Healthline‘s article. Let’s talk about the recipe now. 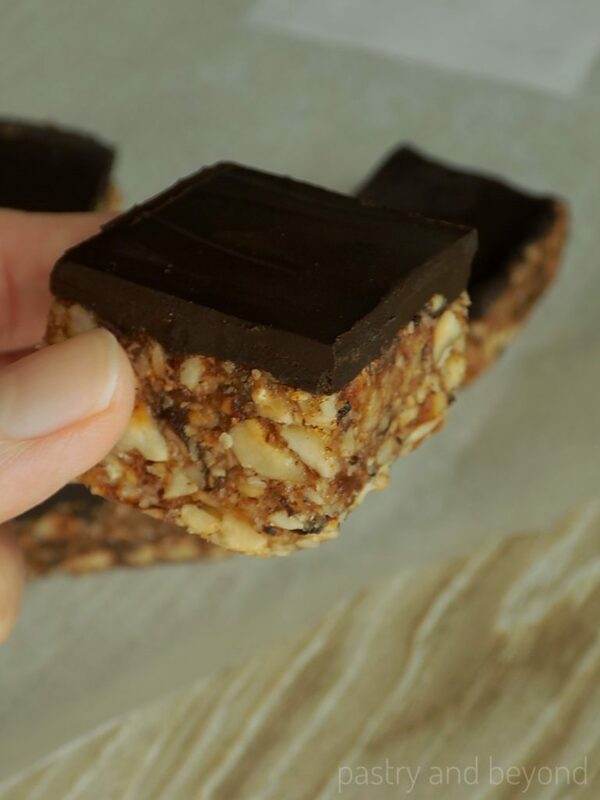 I make these healthy no-bake mini date and hazelnut bars very quickly. First I soak the dates in hot water for 15 minutes. If your dates are too soft you don’t need to keep that much in water but if they aren’t soft enough you may need more than 15 minutes. When they are soft, you will have a soft paste. Your machine will work properly. While the dates are waiting in the water, I toast the hazelnuts. This time I have raw hazelnuts. It takes 5 minutes to toast them. I stir in every 15-20 seconds to avoid burning. You may or you may not want to take the skin off. I prefer to keep them since they are antioxidants- as I mentioned above. (I take only the ones that become too dark to avoid a bitter taste, I keep the rest.) If you want to remove the skin, you can rub the skin with your hand or with a paper towel. Even when you mix the hazelnuts with a spoon, some of them will be removed. Then I put the dates into a food processor and pulse until they become a paste. After, I add in the chopped hazelnuts and mix until they form a paste. I spread the mixture evenly with my hand and then with a spoon into the pan. I melt the chocolate over bain-marie(I show how to make bain-marie in my lemon curd post). When the chocolate melts, I pour the chocolate over the mixture. I keep at least 15 minutes in the fridge until the chocolate sets. After I take the pan the from the fridge, I lift the paper from the sides. First, I slice the mixture into 6 even rectangles. Then I cut each bar into 3 pieces. You will have 18 small squares. 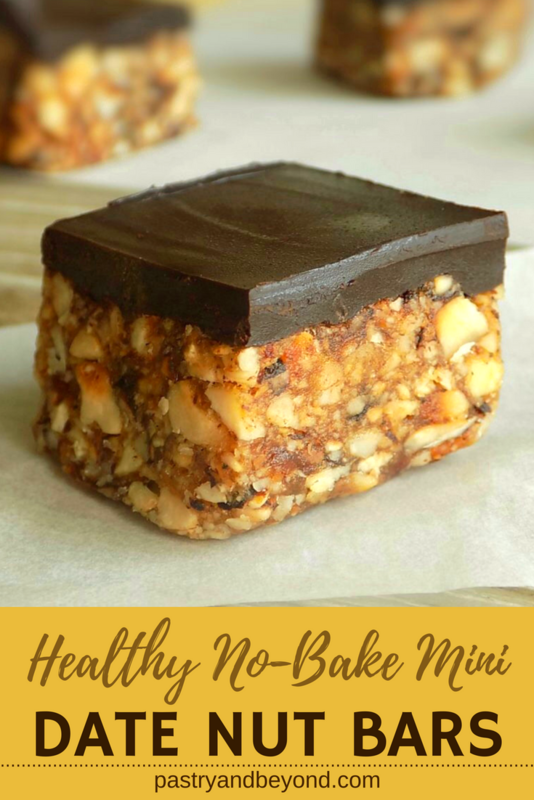 Enjoy these healthy mini date nut bars! 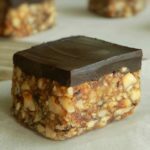 You can easily make these 3 ingredient healthy no bake date nut bars when you want to eat something healthy and sweet! Grease 8*4 inch (21*10cm) loaf pan and line the bottom and sides with parchment paper, about 2 inches(5 cm) of overhang on each side. 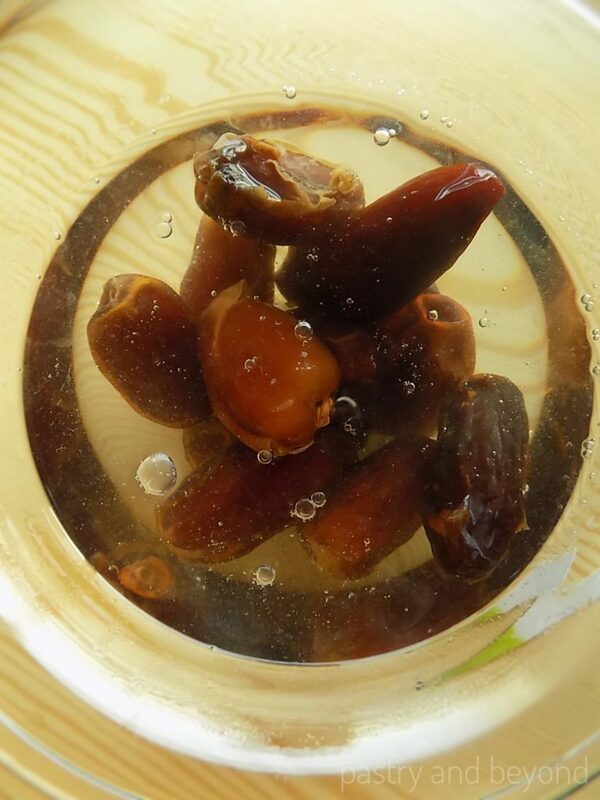 Soak the dates in hot water for 15 minutes or until they are soft. Toast the hazelnuts in a pan over medium heat for almost 3-5 minutes. 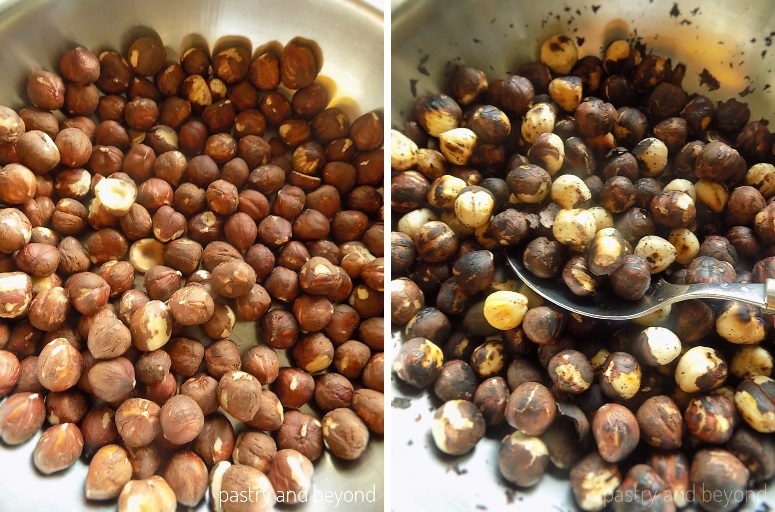 (If your hazelnuts are raw it takes 5 minutes. If you want to take the skin, rub the hazelnuts with your hands or with a paper towel) Stir in every 15-20 seconds to prevent them burning. Take them from the heat when they give off their aroma. Let them cool. As the dates are soft enough, remove the pits. 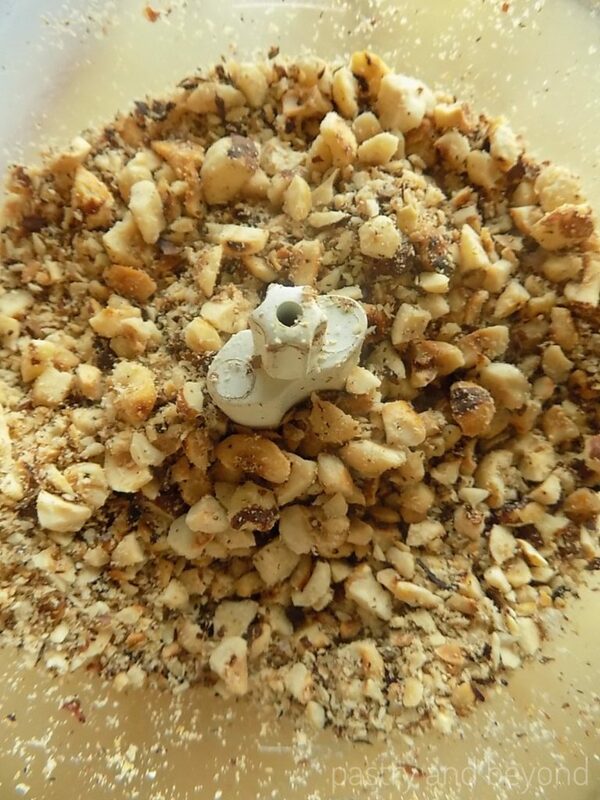 When the hazelnuts are cool, place them into a food processor and pulse for 8-10 seconds to make big and small hazelnut pieces. Remove the chopped hazelnuts into a bowl. 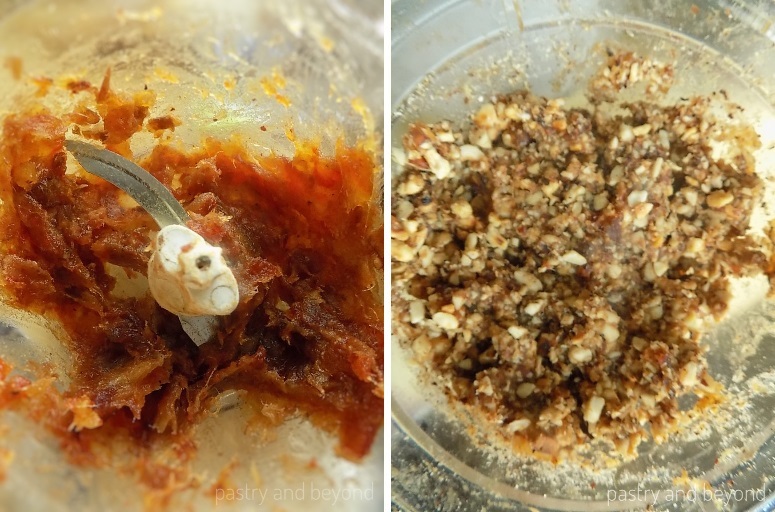 Put the dates into the food processor and pulse until they turn into a paste. Add the chopped hazelnuts into the food processor and mix until dates and hazelnuts form a paste. Spread the mixture evenly with your hand and spoon into the pan. Melt the chocolate over bain marie:Place the chopped chocolate into a heat proof bowl that sits over a pan of simmering water. Stir often. You can melt the chocolate in the oven: Place the chopped chocolate into an ovenproof dish. When the chocolate starts melting, stir the chocolate. Stir as needed. Pour the chocolate over the hazelnut-date mixture and keep in the fridge for 15 minutes or until the chocolate sets. Slice the mixture into 6 even rectangle bars. Then slice each bar into 3. It makes 18 small squares. *You can use 180g (1 and 1/2 cup) hazelnuts for chewy bars. I love the natural sweetness of dates! And the combination of chocolate and hazelnuts is a classic for a reason! These look tasty. I appreciate that you included step by step pictures as well! Who would have thought that there are just 3 ingredients at play here just by looking at the photographs. They look amazing. Definitely something that would appeal to my family. Thank you! Yes, it is hard to say there are only 3 ingredients:) I hope you make and enjoy! Love that you only need 3 ingredients for this! 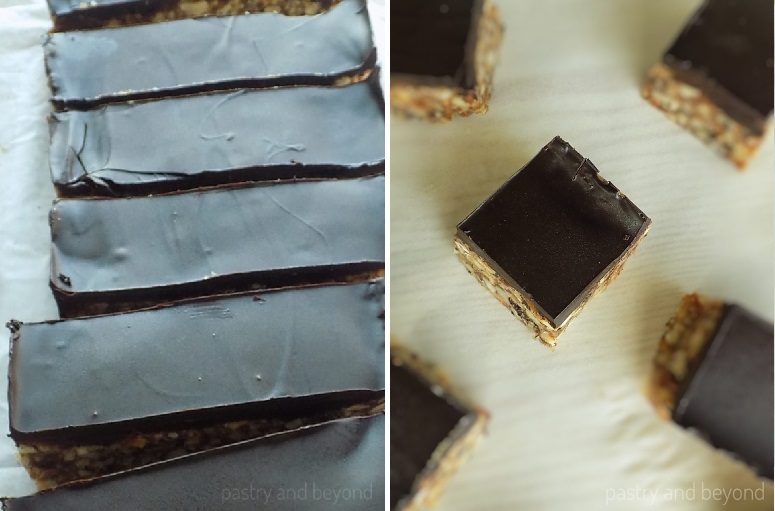 These look very tasty and I love that they are no-bake too! Thank you! They are yummy and healthy. 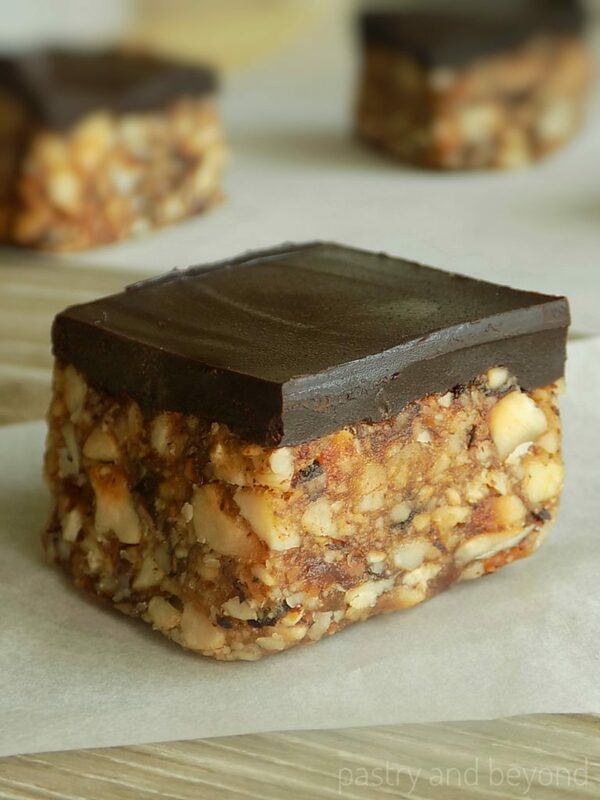 Chocolate and hazelnuts are the classic combos and it’s one of my favorites. This is perfect for my after workout session. I love chocolate and hazelnut combination a lot. 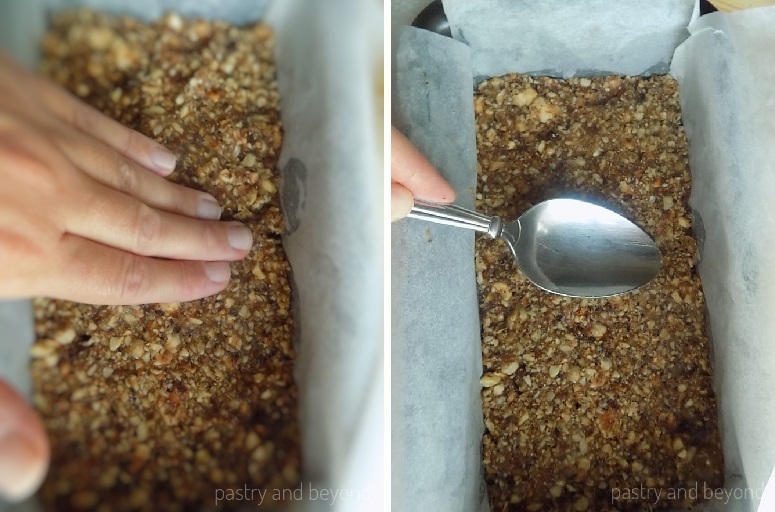 I hope you make these healthy bars and enjoy! Love, love, love these gorgeous bars!! I make a similar date brownie with marbled chocolate glaze 🙂 Quick and fantastic ! Hi Charmaine! Sure, you can use other toasted nuts or a mixture.